A totally different climate but very quickly, Tyrese Knight from the heat of the Caribbean island of Barbados acclimatized to the just above freezing temperatures of Minsk on Tuesday 13th November, as play commenced in the qualification group stage of the Men’s Singles event at the 2018 ITTF Challenge Belgosstrakh Belarus Open in Minsk. He was one of several players on duty who caught the eye as matters commenced in a competition where there is minimal margin for error. In the initial Men’s Singles stage, there are no less than 43 groups; players finishing in first place in groups no.1 to no.21 advance directly to the main draw, those in groups no.22 to no.43 must play a preliminary round in order to join the 32 seeds in a main draw of 64 players. Impressively, Tyrese Knight beat the host nation’s Mikhail Tsyhanouski in five games (11-8, 11-9, 8-11, 11-6, 12-10). An impressive start by Tyrese Knight but for the other names who attracted the attention, it was success in hard fought full distance seven games contests: Belgium setting the example. Florian Cnudde eventually overcame Pavel Daunarovich of Belarus (9-11, 9-11, 11-7, 11-3, 11-9, 11-5, 11-8); Thibaut Darcis secured a hard fought win in opposition to Kazakhstan’s Alexander Gerassimenko (7-11, 11-4, 14-12, 7-11, 7-11, 11-7, 11-5). Defeat for the host nation by a narrow margin, conversely for Ilia Barbolin it was success by a narrow margin; he overcame Russia’s Andrey Semenov in a full distance duel (10-12, 11-4, 6-11, 11-9, 11-6, 6-11, 11-8). 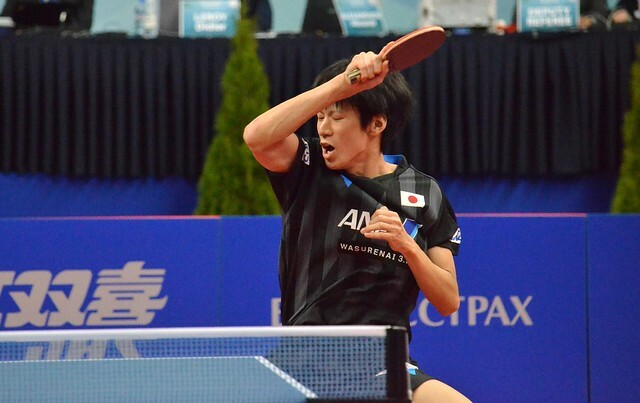 Likewise, there was success in seven games contests for Chinese trio of Sun Zheng, Zhou Hangcheng and Zhang Haipu all new to the international arena. Sun Zheng beat Saudi Arabia’s Naif Al-Jadai (11-7, 9-11, 12-14, 11-7, 11-4, 9-11, 11-6), Zhou Hangcheng overcame Poland’s Artur Grela (14-12, 8-11, 11-13, 9-11, 11-6, 4-11, 11-6). Similarly, Zhang Haipu prevailed in opposition to Rémi Menand of France (5-11, 11-8, 15-13, 5-11, 11-13, 11-9, 11-7). Meanwhile, not to be overshadowed, the defensive skills of the Czech Republic’s Stanslav Kucera overcome Korea Republic’s Cho Jihoon (3-11, 11-9, 8-11, 11-1, 8-11, 11-7, 11-6). Play in the group qualification stage of the Men’s Singles event continues later in the day.